Day One. Plymouth Sound delivered champagne sailing conditions for the first day of the International Canoe Europa cup in Plymouth sponsored by Ullman Sails. With a steady south south-westerly wind of 17 knots and bright sunshine conditions on Plymouth Sound could not have been more perfect. 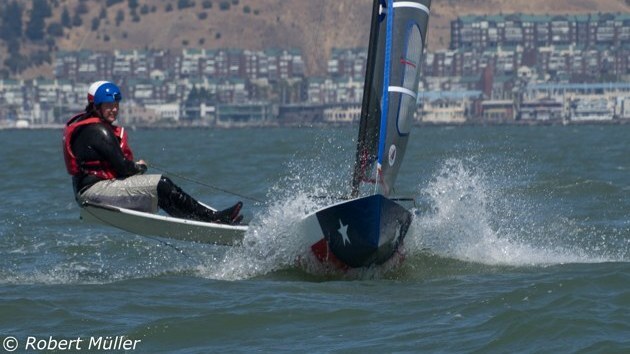 Race Officer Keith Kendall was able to set a 0.9 mile windward leg within the sound providing a windward Leeward course for AC boats and a Olympic triangle for the IC class. First start away was the IC Fleet with Alistair Warren winning the pin in Dragonfly to hit the left side of the beat to sail to an unchallenged win in race 1. 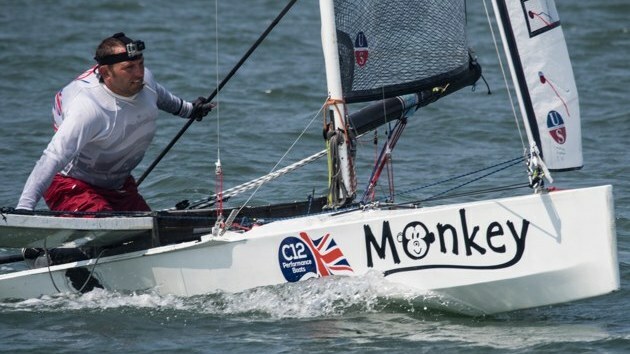 Chris Hampe in Monkey was forced right early on but pulled back on the second half of the beat to round the windward mark in 2nd along side Simon Allen. Steve Clark in his Morrison design closed up on the downwind legs but could not match the upwind pace of Warren and Hampe to finish 3rd. Race 2 provided a drag race between Hampe and Warren both aiming to hit the left side of the beat. Things stayed close with Warren just ahead as both boats took the first tack back towards the centre of the course. From here it was Alistair Warren who made a big gain inside the lift to the windward mark on Dragonfly although Chris Hampe on Monkey showed great speed to close up on each downwind leg. On the final beat Monkey's challenge failed with gear failure causing a race retirement, which left the ever consistent Simon Allen to come home in 2nd place behind Alistair's Dragonfly and ahead of John Ellis in 3rd. The second start was for the Asymmetric fleet and at the front it was the battle of the Welsh Chargers Robin Wood of Llandegfedd Sailing Club was the only AC to stay upright to take two race wins with Aberaeron Yacht Club's Steve Bowen taking both 2nd places. Rob Bell is currently the best of the rest in 3rd overall with a 4, 3 scoreline from the two races. Day two of the Ullman Sails International Canoe Europa Cup started with heavy rain and a light southerly breeze. The race committee and safety boat teams from our host at the Royal Plymouth Corinthian Yacht Club did an excellent job setting three races either side of shipping movements to ensure a fair and clear course was maintained. 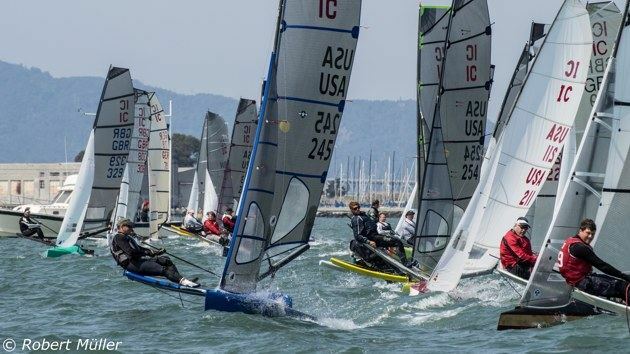 With lighter winds the International Canoe fleet was much more tightly bunched with several place changes as the wind speed and direction varied throughout the races. In the end there was no stopping Alistair Warren from scoring three race wins from John Ellis who maintained a set of three second places to move up to second overall. The real battle is for third overall and a capsize for Steve Clark whilst leading race 3 could prove costly as after the discard is applied sits tied on points with Simon Allen and Chris Hampe. 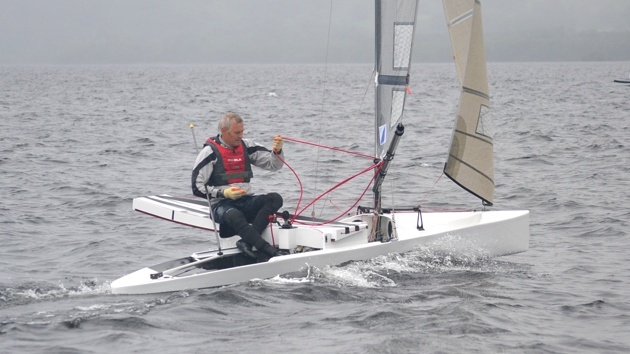 In the Asymmetric fleet Robin Wood scored 1, 2, 1 to extend his lead over Steve Bowen who had a scoreline of 2, 3, 7. Tony Robertshaw jumps up to 3rd overall after winning race 4 and finishing 2nd in race 5. Day 3. The International Canoe is the fleet that just keeps giving, if by 'giving' different sailing conditions on each day is what your looking for. With the first course set and started in a south westerly 10 knots it took a couple of laps before the wind filled and came round to the west. 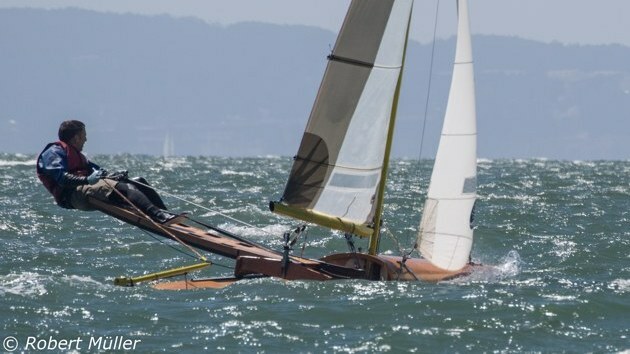 With the first mark set under Fort Picklecombe the wind there became very strong and gusty, with large shifts making sailing very difficult with helms struggling from being out on the end of the sliding seat in 20+ knots to jumping back to the centreline in sub 5 knots within seconds. Alistair Warren jumped into a large lead early on in the IC fleet but as the breeze changed Chris Hampe charged down the downwind leg on Monkey to challenge for the lead in a full on the limits drag race to the bottom mark. 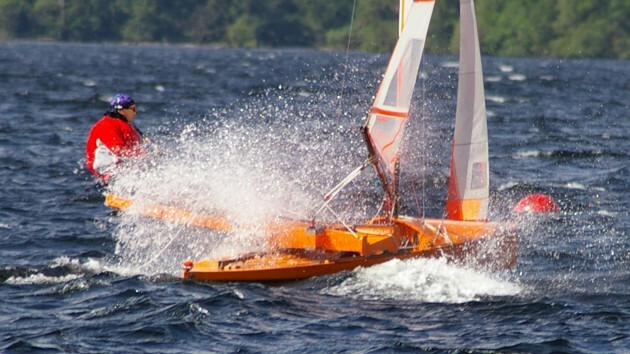 In the end Alistair Warren capsized as Hampe drew level and Simon Allen closed up. The final lap was a one way affair although it would not be plain sailing as each lull under the cliffs provided a risk of capsize. With a change of position of the gybe mark the boats closed together, Hampe lead Warren and Allen with a short beat towards the final mark before a fetch to the finish. The boats split upwind with Alistair Warren making a gain on the left Both rounded the final mark level with Hampe on the outside so it was a final drag race to the finish line and by the narrowest of margins Hampe took the race win with both boats overlapped and unsure as to who was the victor. In the AC fleet the wind direction change meant that for the last lap the spinnakers had to be kept within the boat on the final round at this point however a pecking order had been established with Robin Wood taking the victory from Steve Bowen with Arne Stahl from Germany in third place. Race 2 of the day was the Sailing challenge cup a long distance race with a trophy of reputation equivalent to the 14's POW or N12's Burton Cup. 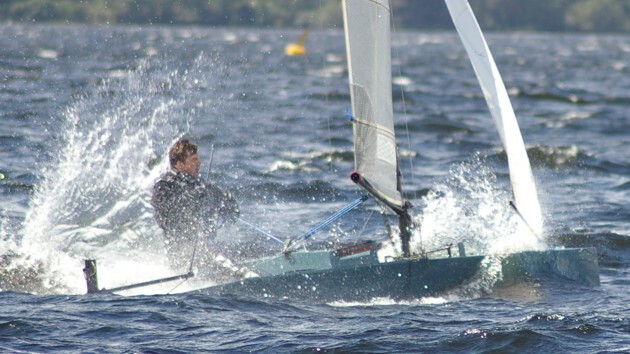 Both IC and AC boats started together and a very short first beat saw Alistair Warren pop clear of the pack. There was quite a pack of boats together as the second leg was a tight reach towards New Grounds that saw a big hole develop on the course forcing most boats to have to beat back to the mark. This allowed Alistair Warren to open up a large lead from Simon Allen, Chris Hampe and John Ellis who rounded some time after mixed in with the lead AC boats of Robin Wood and Steve Bowen. On the downwind legs that took the boats towards the centre of the breakwater and on to Jennycliffe Bay John Ellis passed and put distance on Chris Hampe who continued to fall back until the second lap of downwind action. In the AC fleet it was Arne Stahl who was moving forwards through the fleet eventually finishing 3rd behind Robin Wood and Steve Bowen. Alistair Warren finished first in the IC fleet being able to extend to a five minute lead but it was Chris Hampe who came back from nowhere on the final four legs to first pass Simon Allen on the final beat and line up for another close finish this time with John Ellis. The final run to the finish line was from Ash Buoy to the Royal Plymouth Corinthian Yacht Club and Chris closed the 100m gap at the final mark but would finish 5 seconds behind John with Simon Allen close behind in 4th. With the final day of the International Canoe Europa Cup at the Royal Plymouth Corinthian Yacht Club started with a light south westerly wind. In the IC fleet Colin Newman lead the boats towards the left side of the course where the wind began to swing round to the south and fill in strength. 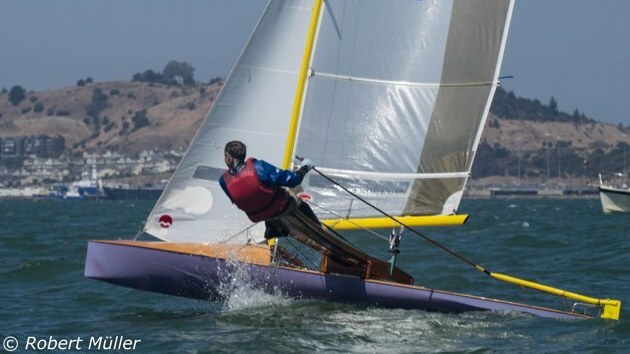 The fresher breeze suited Chris Hampe who led the first two laps until losing positions on the final beat to round the final windward mark in 3rd. 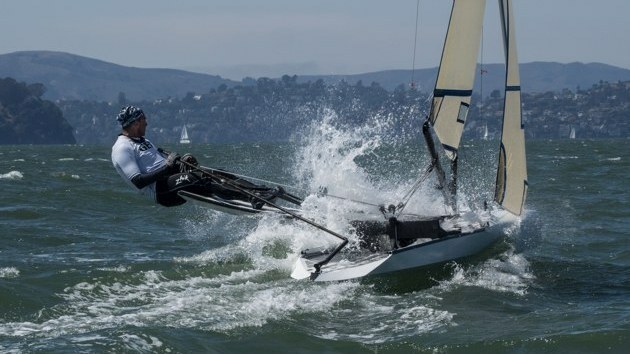 After he cleared the offending weed off his daggerboard he closed the gap to the lead pair and engaged a three way gybing duel with Simon Allen and Steve Clark. Steve held onto the win just a couple seconds ahead of Hampe with Simon Allen just behind the lead pair. 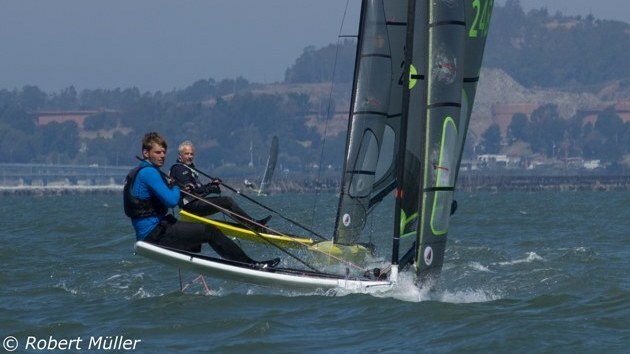 The final race of the championship provided some of the closest IC sailing ever seen at an IC event. The race started with Hampe port tracking the fleet and heading to the right side of the course with Steve Clack and Alistair warren continuing to the left. The lead five boats closed up on each other with Warren and John Ellis just inches ahead of Hampe Clark and Allen. 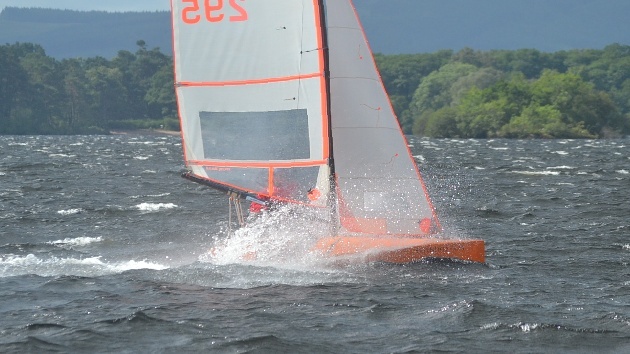 The boats split unwind and it was Alistair Warren now with a clear lead with Steve Clark dropping back down the order. With Alistair Warren out in front with the title secured It was another photo finish that would decide 2nd place overall between John Ellis and Chris Hampe. On the final downward leg it appeared that John Ellis had better speed as he passed into a boatlength's lead to leopard Simon Allen dived over the top of Hampe into 3rd place. Moments later Hampe made his move sailing fast and high to repass Allen on the inside before gybing back towards the mark on starboard to round a boatlength behind Ellis. John Ellis however had a slow wide rounding allowing Hampe to climb above his line as both boats drag raced along the short fetch to the finish line. At the blind there was just inches in it as Hampe crossed the line first timing the two boats obviously points with the tiebreak falling in Hampe's favour. Overall Alistair Warren was consistent across the varying conditions throughout the event and was a worthy winner well clear of the chasing pack. 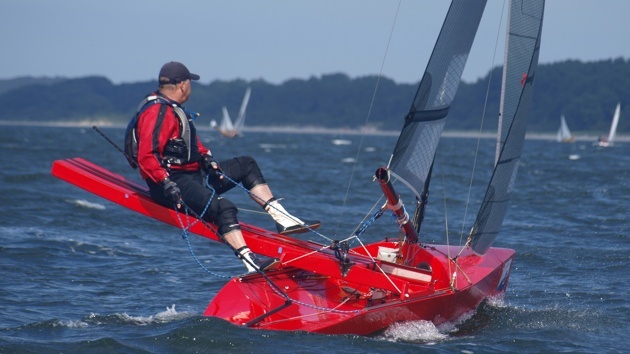 Simon Allen was the first ICOD boat whilst Steve Clark womb the novice cup. In the AC fleet Steve Bowen won he first race to se sure himself second overall from Phil Allen in 2nd and Arne Stall 3rd. Series leader Robin Wood finished mid fleet but if there was any doubting his credentials he went on to take win number 7 in the final race Phil Allen was second again clearly enjoying he conditions to stay ahead of Steve Bowen in third place. Overall Robin Wood continues his dominance of the class with Steve Bowen also clear away from the rest of the pack. Tony Robertson held in to 3rd lace from Arne Stahl whose 4th place finish was outstanding given that the German had to count a DNC due to a mechanical failure on route to the championships. The event was a great success and thanks must go to the race officer Keith Kendal for fitting the full schedule of races in dispute the varying conditions. Further thanks must go to the safety boat crews without who we could not sail, John and Nikki Buckler for there help organising the event and results and finally to our sponsors Ullman Sails. Chris Hampe (This report first appeared on the Yachts and Yachting web site).